Worse day? Quarrel with a guy? Problems at work? Not enough sleep? Bad weather? There can be a million reasons for a bad mood. Most of us chocolate seems to be the most effective “improvement” to humor. In fact, there are as many as 6 foods that improve the mood! It’s scientifically proven! “You are what you eat” – this saying is not an empty slogan. The selection of our daily menu affects not only how you look, but also how you feel. It is not only about physical well-being, that is, about stomach pains or digestive problems. I also mean the psyche – yes, food can really affect your current mood! It is worth using this knowledge every day. A worse mood does not necessarily have to be bitten off with another chocolate bar or drowned in a huge ice-cream box. There are also other products that will help you quickly deal with the sorrows. What? Maybe in childhood, spinach did not improve your mood – many children hate this delicacy and get a hysterical attack at the mere sight of green mush. However, this vegetable has so much folic acid in it that it effectively improves the mood, and in addition it can protect against depression! In addition, spinach contains one more magical ingredient: tryptophan. It is an electrically neutral amino acid that has relaxing and relaxing properties. To fully enjoy the benefits of this relationship, however, you should eat vegetable in raw form. Tough day? You’ll need a good top-up – what about a little … zinc? Eating a banana can not only improve your mood, but even … ensure a calmer sleep! This fruit also increases the secretion of neurotransmitters in the brain that respond to the transmission of signals between the nerve cells. Thanks to this, your mind feels stimulation, and thus – the mood becomes much better. These seafood contain a lot of vitamin B12, which positively affects our concentration and ability to remember. It is necessary for the proper functioning of the entire nervous system. Tasty mussels will help you when you need a lot of energy, and also improve the work of your brain. Thanks to the zinc content, they will make you more resistant to stress! This spice has been used for many centuries as a natural “enhancer” and anti-depressant! It’s very simple – just add it to your favorite food! 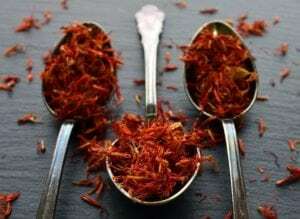 Saffron stimulates our nervous system to secrete more dopamine and serotonin, thus affecting the mood identically as tempting (and much more calorific) chocolate. It’s worth to like this spice! This fish is rich in omega-3 fatty acids. Thanks to this, it relieves the symptoms of depression! In addition, it contributes to increased production of so-called happiness hormone, or serotonin. Specialists recommend that you eat salmon 2-3 times a week. Interestingly, some studies indicate that eating a dish prepared from this fish can even ease menstrual pain! Maybe you did not expect this vegetable in such a statement, but the facts are irrefutable! Celery reduces the level of stress hormone in the blood. The flavors contained in this vegetable have a calming effect. For centuries it has also been considered a natural aphrodisiac.